This dribbling drill uses all players on the team at the same time. Use an area depending on the skill level and number of players available. For example, the younger the player, the bigger the area. Have a lot of basketballs on hand for this basketball dribbling drill. Place all the players in the predetermined area with a basketball. Designate one player as "it". Players are to avoid being tagged. When tagged by the "it" player the two switch. There are a few very good variations to the drill below. You can play continuously where the tagger switches or you can decalre a winner where when tagged the player is out of the game. 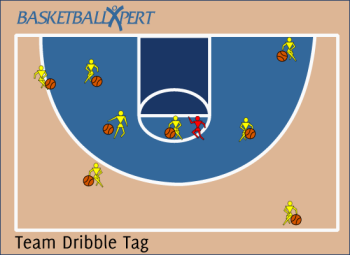 For older basketball players, have the players dribble two basketballs. Divide into teams and have one tagger on each team. Focus on good dribbling skills. Player must keep their heads up and be aware of not only the "it" player, but all others on the court. Recognizing space and accelerating to escape with the dribble. Do not be out of control.